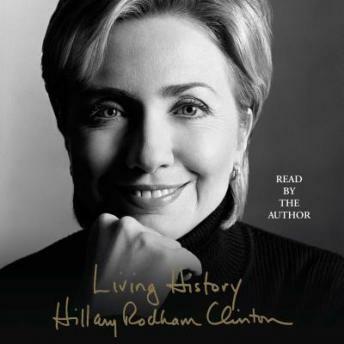 Hillary Rodham Clinton’s deeply personal and historically significant memoir about her eight years as First Lady. Hillary Rodham Clinton is known to hundreds of millions of people around the world. She writes with candor, humor, and passion about her upbringing in suburban, middle-class America in the 1950s and her transformation from Goldwater Girl to student activist to controversial First Lady. Living History is her revealing memoir of life through the White House years. It is also her chronicle of living history with Bill Clinton, a thirty-year adventure in love and politics that survives personal betrayal, relentless partisan investigations, and constant public scrutiny. Hillary Rodham Clinton came of age during a time of tumultuous social and political change in America. Like many women of her generation, she grew up with choices and opportunities unknown to her mother or grandmother. She charted her own course through unexplored terrain—responding to the changing times and her own internal compass—and became an emblem for some and a lightning rod for others. Wife, mother, lawyer, advocate, and international icon, she has lived through America’s great political wars, from Watergate to Whitewater. The only First Lady to play a major role in shaping domestic legislation, Hillary Rodham Clinton traveled tirelessly around the country to champion health care, expand economic and educational opportunity, and promote the needs of children and families, as she crisscrossed the globe on behalf of women’s rights, human rights, and democracy. Intimate, powerful, and inspiring, Living History captures the essence of one of the most remarkable women of our time and the challenging process by which she came to define herself and find her own voice—as a woman and as a formidable figure in American politics. I loved it. Hillary does a great job describing every event. Great read if you into politics and wanna know what she has accomplished. Not worth reading. I love Hillary, but this was awful. Hillary is such a dynamic woman, I expected more from her book. I enjoyed seeing the white house from her perspective but it isn't a biography. Not what I expected. This is not the book. This is a speech by Hilary, commenting on the book. The speech itself is good, and she does give a few excerpts from the book, however, I was disappointed that this was not the actual book. I expected the book and was not interested in the lecture. I still want to hear the book. I wish I read the other reviews. I was interested in the listening to the book, not a hearing Hillary talk about the book. The title of this selection should really be changed. I was surprised to find this book was only 1 CD long. I thought it was her autobiography so I was disappointed that it was merely a speech. I also enjoyed listening to the speech, but was really disappointed because I thought it was going to be a reading of the entire book. Description is missleading. I enjoyed listening to the speech, but was really disappointed because I thought it was going to be a reading of the entire book. Although I don't support abridged versions, this one provided a more than adequate representation of the former First Lady's experiences leading up to and during her years in the White House. I would have liked to have heard more about her decision to run for Senate, but she provided an amazing overview of the Clinton presidency with a balanced presentation of both the good and bad. The 90's were an amazing decade and the Clinton's helped to shape the economic recovery and fostered renewed optimism. The book provides a nice reminder of the events of that decade which had us living the good life in the shadow of forboding about what was to come in 2001.